The October 21 and 22 clinic at the Riding Centre with Elaine Meredith Steele has been cancelled. Full refunds will be provided. Posted on October 10, 2017 by The Riding Centre. Posted on July 13, 2017 by The Riding Centre. 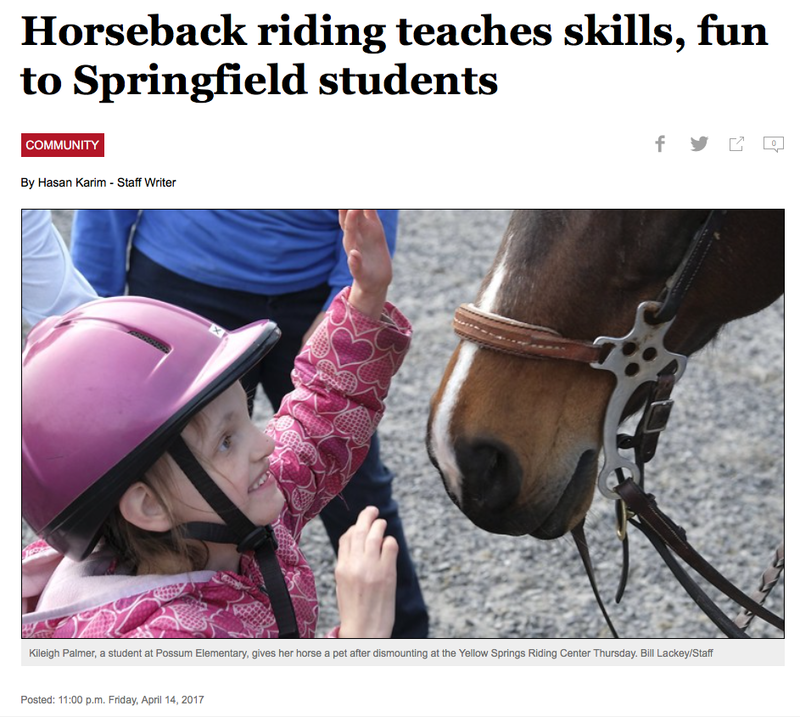 Read about how the Riding Centre benefits the program at Possum Elementary School here. Posted on April 16, 2017 by The Riding Centre. Join us at The Riding Centre in Yellow Springs, Ohio on May 6, 2017 for a fundraiser jumping clinic with Jim Nealon. This clinic will focus on grid work and stadium jumping. Good prep for the spring events. All levels welcome. Group lessons: $45.00 per rider. All proceeds go to support the programs at The Riding Centre. Please contact Jim Nealon at jfnealon@hotmail.com by April 29, 2017, if you would like to participate. Posted on April 8, 2017 by The Riding Centre. Jumping Clinic with Jim Nealon on May 6! Join us at The Riding Centre in Yellow Springs, Ohio on May 6, 2017 for a fundraiser jumping clinic with Jim Nealon. This clinic will focus on grid work and stadium jumping. Good prep for the spring events. All levels welcome. Group lessons: $45.00 per rider. All proceeds go to support the programs at The Riding Centre. Please contact Jim Nealon at jfnealon@hotmail.com by April 29, 2017 if you would like to participate. Posted on March 20, 2017 by The Riding Centre. Time to Start Planning Your 2017 DLSC Season! Year End Awards Banquet @ the Beavercreek Country Club, Friday, November 17th. Remember, 4 shows at the same level automatically enters you for our Year End awards! (see omnibus when it comes out for full Year End Award details). We're also doing the T.I.P. Awards again in 2017, sponsored by The Jockey Club! Posted on December 9, 2016 by The Riding Centre. Support Us by Using Amazon Smile This Holiday Season! Posted on November 21, 2016 by The Riding Centre. The 2017 Riding Centre Calendars Are Here! If you ordered a calendar, you should be receiving it shortly. If you would like a calendar, you may use the order form. The cost is $15. This is a fundraiser, and a great way to support our horses and our programs. A special shout out to Jennifer Lawson for generously donating her time and talent to produce this beautiful calendar! Posted on November 19, 2016 by The Riding Centre.